Dive Resort Seychelles is a 5 star PADI centre, an award granted for consistently high standards of quality and safety. 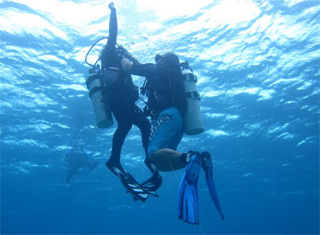 We offer the complete range of PADI courses applicable to our warm Indian Ocean environment. Together with our staff we can schedule your course to fit your holiday timetable as much as possible. Qualifications: Master Scuba Diver Trainer, EFR Instructor. Background: This course is designed especially for children that are competent in the water but are too young to participate in other scuba diving courses. During this course your child will be taught a little diving theory, some diving skills and enjoy playing underwater games using scuba equipment in a swimming pool or similar calm, shallow underwater environment whilst under the supervision of a diving instructor. 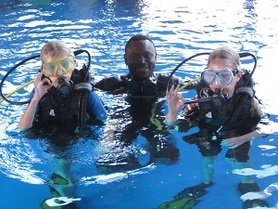 Background: This course is designed for those that wish to get a taste of scuba diving. 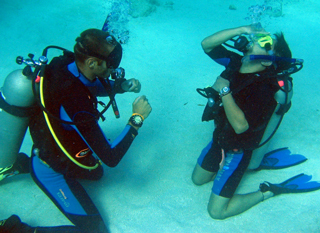 Basic level scuba diving theory is taught with the use of video. This is followed by a pool session where the candidate learns basic scuba skills and gains underwater confidence. 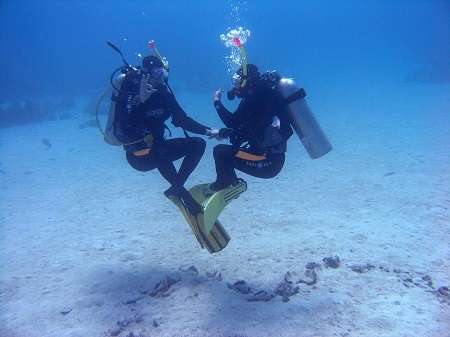 The candidate then goes on a dive trip accompanied by an instructor. After participating in the course you may continue to dive with us during your holiday to a maximum depth of 12m with one of our instructors. Master Scuba Diver Trainer and EFR Instructor. Background: This course is designed for those that want to learn to dive but have insufficient time to complete the Open Water Course and those that have no wish to dive independantly or below 12m. This course takes you half way to becoming an open water diver. You will participate in three theory sessions, three pool sessions and two open water dives. 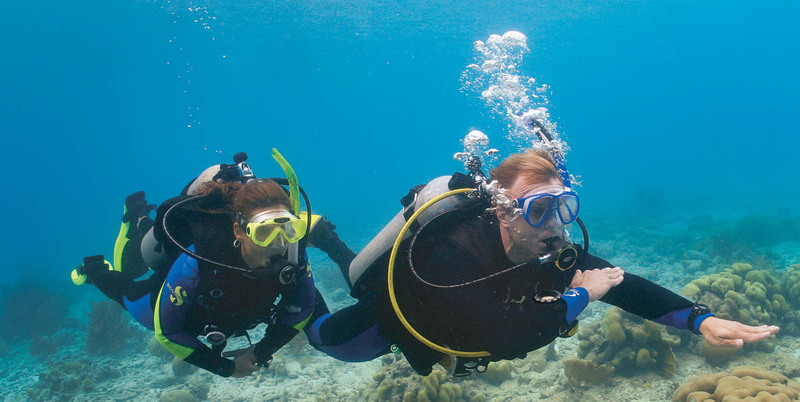 After the course you may continue to dive under the supervision of an instructor or divemaster. If subsequently you decide to become an open water diver this course will be credited towards your open water qualification. Background: This is the PADI entry level scuba qualification. Completion of this course entitles you to dive independently with your buddy within conditions you have experienced in familiar sites. You will participate in five theory sessions, five pool sessions and four open water dives. After the course you may continue to dive under similar or better conditions than those you have experienced independently from professional supervision to a depth of 18m. There are many exciting adventure dives, specialties and courses you may participate in after achieving this qualification. Continuing your diver education will fine tune your skills, give you extra confidence and increase your experience. Qualifications: Maritime Training Centre Graduate. Background: An Advanced diver is a diver that has completed three adventure dives of their choice plus the deep and navigation adventure dive. This course concentrates on skill development in the open water environment, theory is minimal and there are numerous exciting skills that can be learnt. 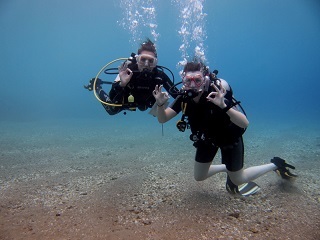 This is an extremely popular course not just because it is so much fun but because the Advanced Diver certification opens up to divers a whole new range of sites that would have been ruled out to them as an Open Water Diver. Dive Resort Seychelles is located in the South-west of Mahe at the beautiful bay of Anse La Mouche. Our five star PADI dive centre is just a stone's throw away from the beach, where we have four boats waiting to take you on your next exciting scuba diving adventure. Seychelles is one of the most beautiful places in the world to dive and here in the South of Mahe is by far the best. The Four Seasons Resort Seychelles.